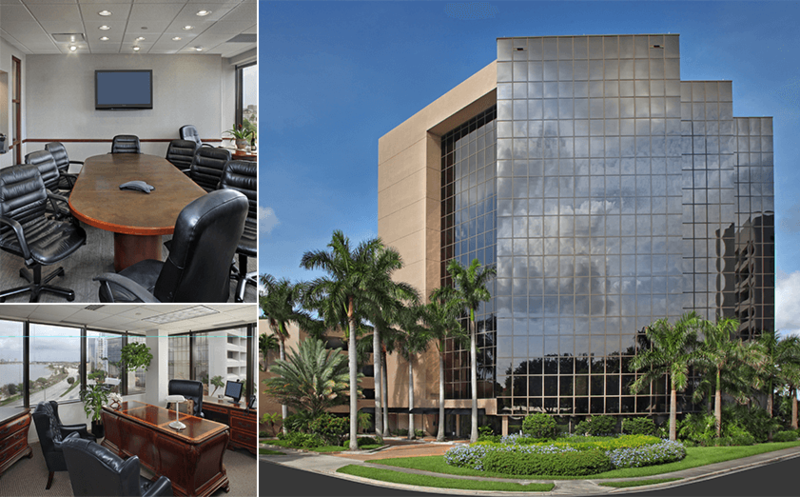 500 Clearlake Executive Suites is within a beautiful office setting located in the heart of downtown West Palm Beach. We provide businesses with professional offices, Office Suites, Virtual office, conference rooms and a host of business services. Our ultimate goal is to provide your company with a professional, corporate image while supporting all of your business needs. Our qualified admin services and state-of-the-art equipment are all available, right on the premises. With everything at your fingertips, you can focus on your business and its success. The setting is professional and handsomely appointed, a place where you’ll be proud to meet clients. 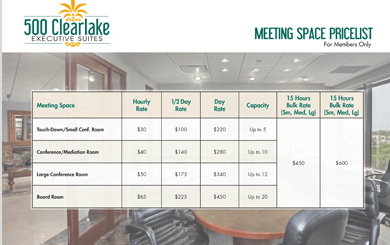 500 Clearlake Executive Suites is conveniently located right off I-95, just minutes from City Place, the Palm Beach County and federal courthouses, and Palm Beach International Airport. Complimentary valet and free parking is provided. Individual offices and suites, furnished or unfurnished, with a city or a waterfront view. Prices range from $425 to $1200/month. Friendly phone reception service, voicemail, call forwarding, voicemail and fax to email. Virtual office programs Conference Centers both large and small. Conference Centers both large and small. 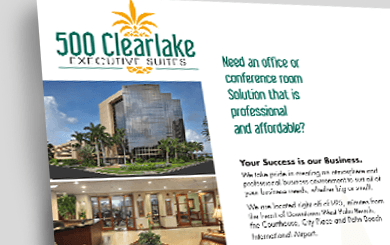 Check out this fact sheet that details the primary advantages of 500 Clearlake Executive Suites. We offer all sorts of ways to make small and big businesses hugely successful. 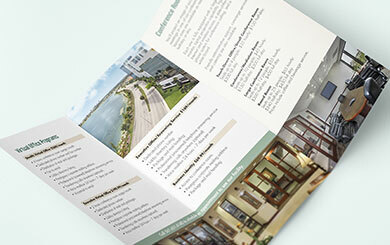 If a quick look isn’t enough, feel free to download our brochure. It explains our virtual office programs, executive suites and conference rooms in depth, so you can make the best choice. We can accommodate meetings of just a few people to as many as 20. Rates are by the hour, half-day or full day. You can also buy meeting hours in bulk to cut costs even further.